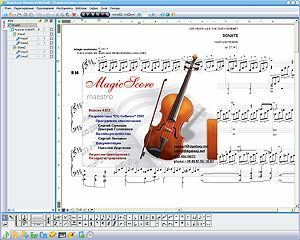 MagicScore Maestro is a music notation software application with extended editing capabilities and internal spell-checker. It features a variety of input methods - virtual keyboard, external MIDI devices, or an extended set of musical note symbols. The program comes with a virtual piano and virtual fingerboard for six and seven-string guitars. The built-in notes play-back feature allows users to listen to the newly created piece of music as if performed by a single instrument or by an entire orchestra.Importantly, MagicScore Maestro makes editing notes easy with tools that let musicians copy, paste, delete, and transpose both single notes and selected note blocks. Drag'n'drop feature is available as well. Conveniently, the program permits creating custom symbols, terms and chords for complex compositions with peculiar or non-standard grammatical solutions. There is an entire set of functions that simplify musicians work packed inside the program, like the adjustment of volume, balance, and effects for each track, and the capability to bind comments, links, and otherappearance elements to all score elements.Moreover, the program can read/write data to/from MIDI and save data in various formats, including graphic files (BMP, JPEG, GIF, WMF) that are easy to print out. Other helpful features include customized texts orientation options, notes volume and effect play-back calculations, and a capability to stop executing any operation any time. The program has been used extensively by amateur and professional musician and education institutions, and got excellent reviews for its simplicity and rich set of time-saving features. The program also supports Music XML format. 1. There feature is added of creating empty pages at the beginning and inthe middle of the composition for entry of text.2. The symbols of "harmonics", "parenthesis for barre", "right hand fingers", "mediator upwards or downwards" are added. O MagicScore Maestro is a music notation software application with extended editing capabilities and internal spell-checker. It features a variety of input methods - virtual keyboard, external MIDI devices,or an extended set of musical symbols. See above information and user's reviews about MagicScore Maestro Music notation software with extended editing capabilities.